On with the thinking cap! Loads of ideas were put forward for fundraising activities and we decided that taking on the National 3 Peaks Challenge, climbing the highest 3 peaks in the UK in just 24 hours, would be a good start. Hindsight is a wonderful thing! I first met Brad and Cyrilyn Moore (now directors of Operation Orphan) many years ago when they both lived locally to me in Lytham. We lost touch over the years but through Ros Mariani, an Operation Orphan Trustee, I found out about the charity and how Operation Orphan had evolved. The connection was re-made, I immediately decided that we should support Operation Orphan and quickly convinced my work colleagues to do the same. Now down to the task! We set about planning our training and had several tough walks including Scafell Pike, Snowdon and even for me a walk up Philosophers Walk in Heidelberg, Germany! We continued to prepare, including gathering all the specialist equipment required to take on the challenge. We had a great walk up Ben Nevis, great weather being sunny but cool, and fantastic views near the summit. The last few hundred feet took us into the clouds and across snow – a first for me in August! We made our descent and reached our waiting drivers in the car park as dusk settled and then quickly set off for Scafell Pike in the Lake District. This is where our challenge took a turn for the worse! I don’t know if it was a combination of energy gels, strange eating times or the rally driving down the winding Highlands roads, but I arrived at Scafell feeling rather unwell after a 5 hour drive. Feeling fresh in the legs though I decided to set off into what had now turned into a pretty awful weather front with rain and wind not entirely welcome in the pitch black and treacherous terrain! We had got about an hour or so into the climb when I suddenly felt too unwell to continue – not the best place to be in those conditions believe me! After attempting to continue I returned to our base with my colleague Rhys and left the remaining 4 members of the group to complete the climb.Team “Peak Supply” (after our Procurement skills!) set off from Preston on the 15th August in two packed cars for Ben Nevis in the Highlands of Scotland. It was a beautiful drive to Fort William and we arrived around 4pm for the first hike. Butterflies had set in but I knew I was with a great team and that we would be OK! 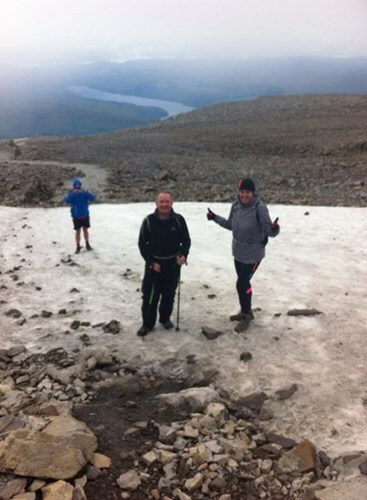 We knew from our previous training climb up Scafell that the total climb time is approximately 4 – 5 hours so when the group had not returned after 6 hours we started to panic! The weather had been terrible and we had seen other groups who had set off after us return and we were on the verge of calling mountain rescue when the team thankfully returned safely. What transpired was that the team had got lost on the descent from the summit and it had taken several attempts to get down. I really take my hat off to these guys for showing the guts and determination to complete this peak in such terrible conditions! After a quick re-group the team set off for Snowdon, another 4 or so hours drive knowing that it was now impossible to complete the challenge in under 24 hours. Undeterred the team proceeded up Snowdon in yet again challenging conditions, recording a peak time of 4 and a half hours and a very respectable 26 hours and 55 minutes total challenge time. Very weary and slightly disappointed at not finishing in less than 24 hours the team were by now just happy to have finished and completed the challenge. I was personally disappointed not to have completed the challenge with them but I was so proud of the effort and commitment shown by the team for the whole fundraising challenge and in the knowledge that we had contributed to making the lives of so many that little bit better. We raised a fantastic total of over £2000 for Operation Orphan and it has whet the appetite for future fundraising activities. Perhaps next time though I will stick to something easier. I feel a cake sale coming on….. Team “Peak Supply” consisted of Barry Holliday, Aisling Carson, Fiona McLaren, Jenna Taylor, Matt Bell, Rhys Woodmason, Paul Butler and Charlie Woodmason.